Huntington Beach, Calif. - Another perfect Sunday afternoon in HB. I thought it was going to be a record breaker when I showed up and there were already 59 bikes in the lot at 2:00. As it turns out, no record, but a great turnout with 107 bikes. We had a wide variety of bikes today and many first time bikes including all our contest winners. We had a clear winner today, but the race was fairly close for all three top contenders. Congratulations to Roland Ortiz of Laguna Niguel for winning Bike of the Month with his 1953 MV Agusta Supersport 125. Roland purchased this bike in January at the Los Vegas Auction. It was part of the Guy Webster Museum collection up in Ojai California. Read all about the 1953 MV Agusta Supersport 125 on our Bike of the Month page. 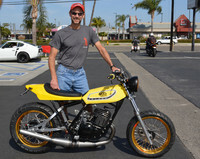 Tony Barrett of Costa Mesa came in Second with his custom 1978 Yamaha DT400. Tony bought this bike two years ago as a bunch of parts. He just recently finished it and this was his first meet with it. Tony's style is Flat Trackers and he usually rides a Honda with a similar style. Tony told me today that he was recently diagnosed with ALS disease, and that this Yamaha would be his last build. He would like to raise awareness and promote research for the cure of ALS. Please visit the ALS Association for more information on how you can help out. Kristina Furlong of Long Beach took Third place with her 1959 Zundapp Super Sabre 250. This was Kristina's first time at our meet. I knew the Zundapp was special when she came in. The Super Sabre was originally built from parts by her Father Loren Furlong. Kristina rode on the back as a kid and plans to hand the bike down to her kids. At any other meet, Tony or Kristina could have taken Bike of the Month, however Roland brought out the big guns with his very rare MV Agusta. The second and third place winners were awarded EuroPapi t-shirts provided by Roland Ortiz of EuroPapi Motorcycle Streetwear, www.europapiusa.com. I was joking, that it was a good thing Roland didn't place Second or Third, he would have won his own t-shirt back. Thanks to everyone for showing up and making this another great event and a special thanks to the team, Tom & Debbie Hopkins. I'll see you next month on May 13, 2018.